The American western novel has a bad reputation. It is reputed to be ethnocentric, violent and, even worse, simple and inaccurate. The good guys are too good, the bad guys are too bad, and the natives are one-dimensional cutouts. The townsfolk—the common working class—are portrayed as stupid, weak, or both. In many cases this poor reputation is deserved—there have been some really, really bad westerns introduced on television, film and fiction. There have also been some damn good westerns over the years—both past and present. To quote Theodore Sturgeon—he was defending SF, but the same rule applies to westerns—“ninety percent of everything is crap.” It is the other 10 percent that separates a viable genre from a dead one and the western is far from dead, whether we are talking about golden age stories or the novels published today. 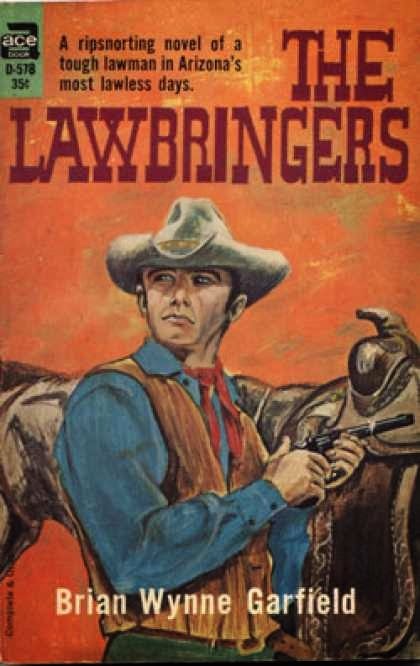 The Lawbringers is a biographical novel about the formation of the Arizona Rangers—a law enforcement agency created by the territorial Governor to combat the seemingly endless supply of toughs and criminals that haunted Arizona in the late-nineteenth and early twentieth centuries. 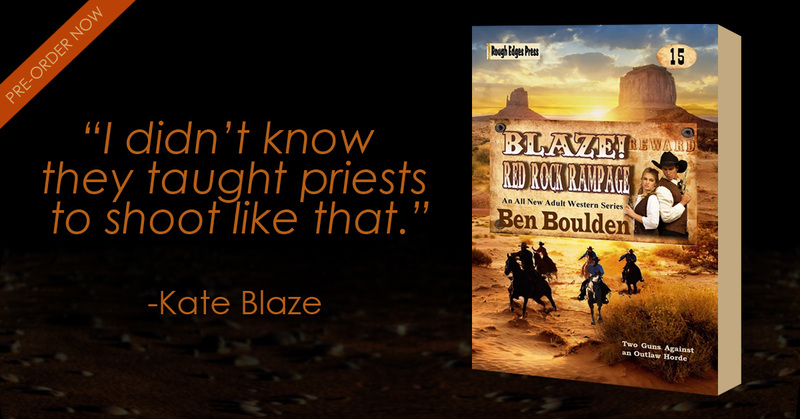 Its focus is directed at the chief Ranger, one Burton “Cap” Mossman, but it is told in an unexpected way. 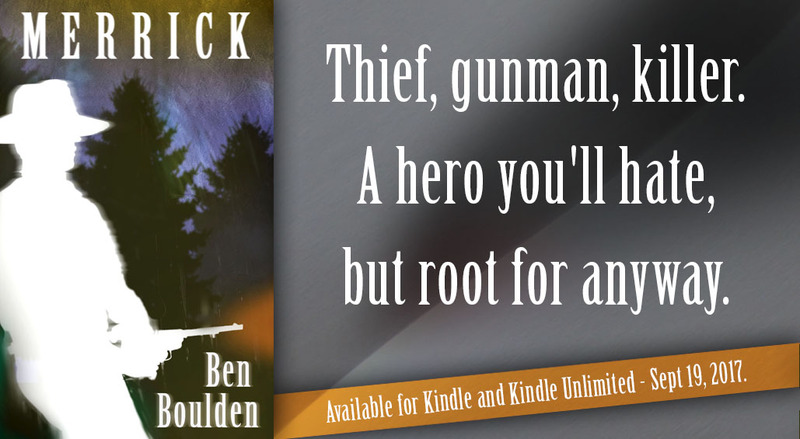 It is a multi-perspective novel that never attempts to get into the head of Mossman. Instead he is painted and defined by the characters around him—some real, others created by Garfield—as a hard, stubborn and tough man. 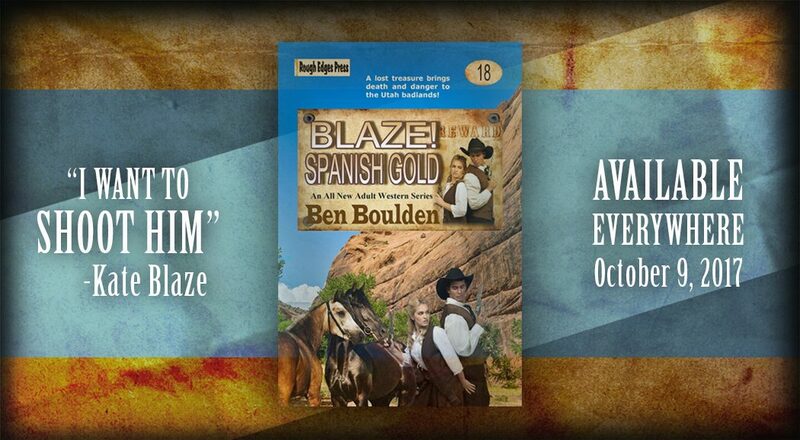 The novel is dedicated to Burt Mossman—“a chivalrous gentleman, a lawman, and an Arizonan.” But it is far from a one-sided novel of adoration. It tackles the man’s complexity as well as his flaws. He is depicted as a hard man doing a hard job. His decisions are made with the citizens of Arizona in mind, but with a frightening lack of color. There are no gradient shades, but rather his view is strictly black and white, and more often than not the end justified the means. He wasn’t above lynching a man to make his point, and the Mexico-Arizona border was less an end to his jurisdiction and more an artificial line to be ignored. Mossman is a man who withstood political pressures and did what he thought best no matter the consequences. He typified the mythical western protagonist, but is portrayed by Mr Garfield as nothing more than a man—stubborn, sincere, and flawed. He had friends, enemies, and admirers, but he hid behind a wall of secrecy and loneliness. He was a man that fit into the demands of an era, but whose era passed quickly and without much fanfare. The Lawbringers manages to does all that and also tell an exciting and tight tale. It has a peculiar heavy quality. It is packed with emotion and wonder; wonder at the basis of right and wrong. It has a conscience without being limited or judged by that conscience. It is complex and wondrous. In short, it is very much part of that 10 percent, which has allowed the western story to survive for more than a century. This post originally went live September 1, 2009 right here at Gravetapping. 20 years. That is how long it has been since we spoke. Since you gave me advice. Since you were part of my life. That last time is vivid in my memory. A hot July evening in the kitchen. The faded, dirty brown linoleum. The white walls. The cheap brown table. You were in a wheel chair; body wasted. Hair so red, so short. That damn bright red seat cushion that gave less than concrete. The pain in your eyes haunting, feverish. The black canker of disease devouring you. Your only grasp on life; hard stubborn will. And love. And maybe fear. Not for you, but for me. I let you go that night. I told you I would be fine. I lied. Every word a lie. I wasn’t alright. I’m not alright. I survive. I’ve survived nearly half my life without you. Without a mother. Without my mother. There are days I hardly think of you, but not many. Mostly I wonder how it would be if cancer hadn’t destroyed you. Eaten you. I wonder what you would teach my child. My daughter with red hair. My daughter with your sweet, kind demeanor. My daughter who you never met. Who will never meet you. That warm autumn day we took the bus to Safeway—why we didn’t drive I will never remember—eating that package of Snowballs on the grass berm waiting for the bus. That day I picked a package of gum—Big Red in my memory—from the shelf and pocketed it without paying. You made me return it. To the store manager no less, and apologize, and promise never to do it again. That day you purchased me a cheap plastic Batman Halloween costume before taking me to Dad’s shop to show it off. It has been 20 years Mom. You have been gone so very long, but still, if I can find silence. A quiet place. If I concentrate. If I want to badly enough, I can still hear you. I can feel the gentle timbre of your voice like a summer breeze. I can feel your pride, joy, sorrow, and disappointment. You are gone Mom, but everything you taught me. Everything you were is still here. It is with me. It is with my family. It is with my little girl. It has been 20 years Mom, and still I miss you. Still I mourn you. Still I love you. Neil Mallory is a former SAS Colonel now working for British Intelligence. 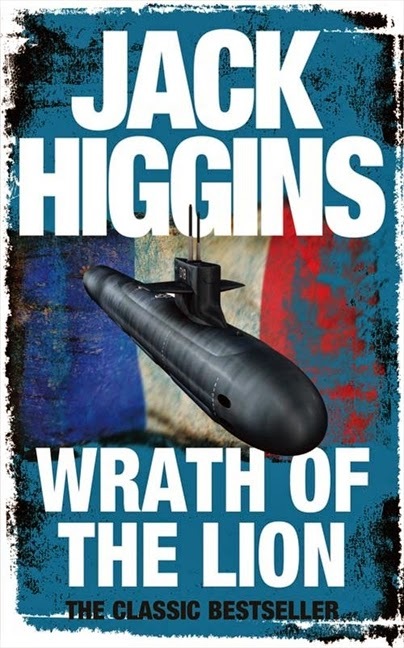 He is sent to a small island in the English Channel, closer to France than England, to search for a French submarine with a renegade crew. The L’Allouette (ironically meaning “lark” in English) has been cruising the French coast making mischief. It forced a boarding on a ship in the Channel and executed an aging public prosecutor responsible for convicting several of the crews’ comrades. Mallory’s mission: find the L’Allouette and call in the cavalry. Unsurprisingly, it isn’t quite as easy as it sounds. The island has only a handful of full time residents, and the heavy, who is a self-exiled former military officer from an old line family, seemingly knows more about Mallory’s doings than Mallory knows about his. The setting is a perfect fit for the period it was written. The bad guys belong to a real world French terrorist organization referred to in the novel as the “O.A.S.,” which is an acronym for “Organisation de l’armee secrete”; or its literal English transaction, “Organization of the Secret Army.” The O.A.S. was a group dedicated to keeping French colonial rule in Algeria. It, most notably, made an assassination attempt on Charles De Gaulle in 1962. —which is everything one expects from a high quality Harry Patterson novel. Neil Mallory may seem familiar to the regular reader of Mr Patterson’s work, and for good reason. A very different Neil Mallory starred in The Last Place God Made; an incarnation that was saw him as bush pilot rather than a former SAS officer. Unfortunately the miles and warmer clime can’t set Burt’s mind right. The only thing that has any meaning is the memory of his dead wife and the life they had, but that is over and there is nothing he can do to change it. Then he meets Alicia Shafton. A woman who seems as lost and lonely as Burt, but she has a secret. Her husband, a gambler and shyster, died and left a lockbox with a note attached. It instructed her to sell the box to a man named Ralph Emory for $200,000. The only problem: Everything goes wrong and Burt can’t help but get involved. 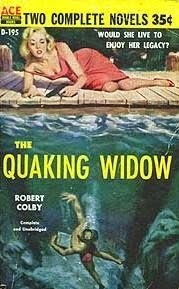 The Quaking Widow is the first work by Robert Colby I have read and it won’t be the last. It hit a note with me—the story, setting, characters—that many works of fiction don’t. It opened with a blast—an immediate and drastic change for a protagonist with an uncertain future—and cruised forward into ever increasing peril. The characters were the expected: sleek, beautiful, mysterious, and good and bad in varying measures. The setting is drawn marvelously. As I read, I mourned the Florida that was. The pre-Disneyland and Miami Vice Florida that was one part hillbilly and another parts chic, wealthy and dangerous. A Florida that a person can get lost in. The same Florida that was painted in the novels of John D. MacDonald with his vivid and beautiful flashes of prose. The Quaking Widow is worth tracking down. It is fifty-three years old, but it is more than just nostalgia. Heck, I wasn't even on the radar when it was written. Instead it is a fine example of a linear and well-told tale that is both entertaining and exciting. It was published by ACE (D-195) in 1956, and coupled with Owen Dudley’s The Deep End. This is a repost. It originally went live August 10, 2009. Since I wrote this review I have read several more Robert Colby novels, and he has become one of my favorite pulp writers. 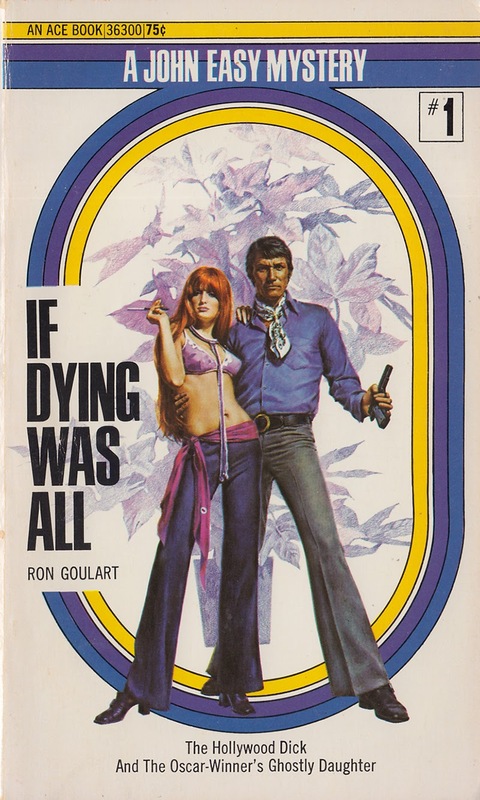 If Dying was All is the first of four novels featuring Southern California private eye John Easy. It was published as a paperback original in 1971 by Ace Books, and the cover art is absolutely groovy. Not just anyone can pull off an ascot, polyester bell bottoms, and Florsheims. The artist: Elaine Duillo. 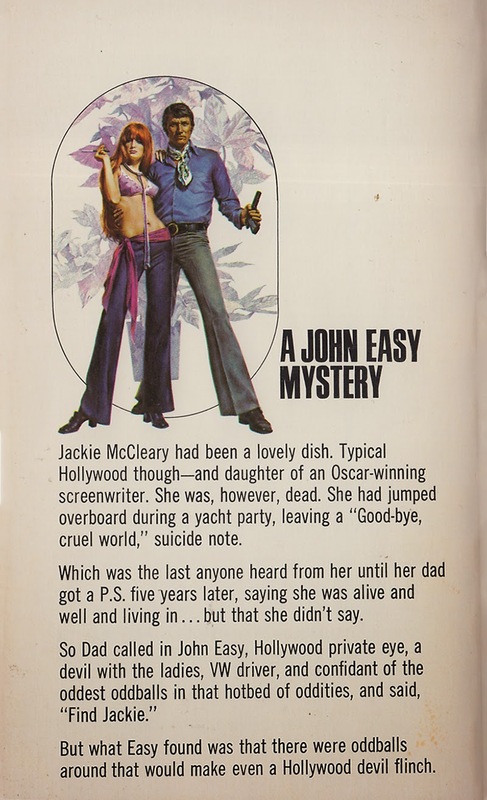 The other three Easy novels are: Too Sweet to Die (1972), The Same Lie Twice (1973), and One Grave Too Many (1974). John Easy also appeared in three short stories—“The Tin Ear” (1966), “You Have to Stay Dead for So Long” (1976), and “They’re Gonna Kill You after Awhile” (1976). This is the sixth of a series of posts featuring the cover art and miscellany of books I find at thrift stores and used bookshops. It is reserved for books I purchase as much for the cover art as the story or author.